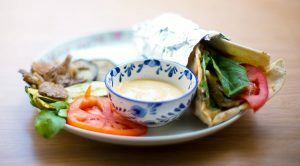 A mix of vegetables and salad served in a flat bread with a refreshing yogurt sauce. Cut the courgette and aubergine into thin slices, drizzle a little bit of olive oil, salt and pepper. Roast them in a preheated oven at 180°C (350°F, Gas Mark 4) for 20 - 30 minutes. The roasting time depends on how thick the slices are. Separate the pleurotus mushrooms one by one and cut off the ends of the stems. Drizzle with a little bit of olive oil, salt and pepper. Put a pan on high heat and cook them for 5 - 6 minutes each side until they cook through. In a bowl, mix the yogurt, curry powder, cumin, paprika, salt and pepper. Use a pan or the oven to heat up the flat bread / pitta bread / chapattis. 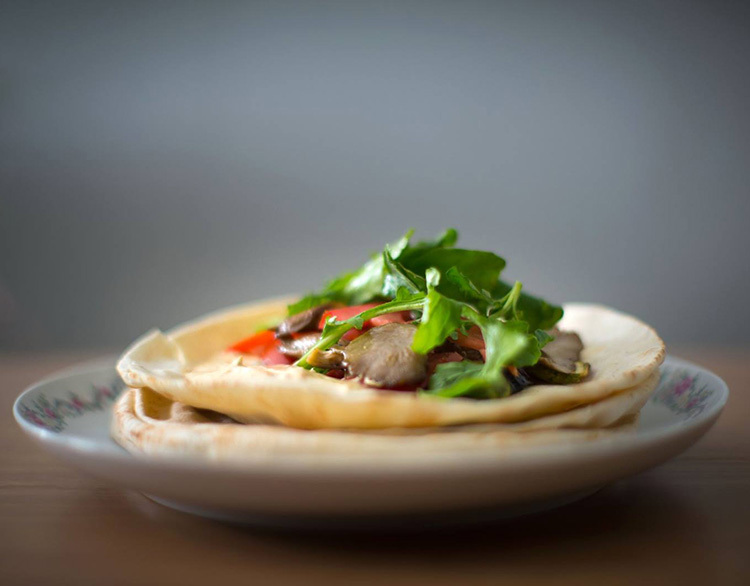 Put each flat bread / pitta bread / chapatti on a plate and put on a few slices of the roasted vegetables, a few mushrooms, 2 slices of tomato, a little bit of rocket and 2 tablespoons of the yogurt dip. Roll it and serve warm.